LB&SCR, SR, BR. 1874-1958+ preservation. See East Somerset Railway rolling stock pages. 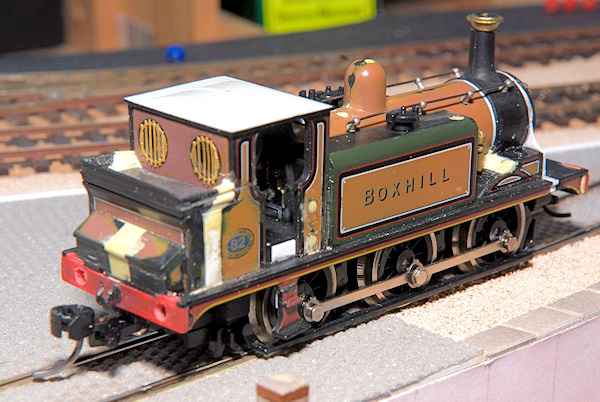 Dapol (now Hornby) LB&SCR 'Terrier'. Height of cab reduced by 2 mm (not 3 mm described by others). Height of chimney reduced by 2 mm. Length of bunker extended by 3 mm (footplate unchanged). New toolbox created by cutting the original in half and filled in the middle with Milliput. Front end of footplate extended by 1.5 mm immediately in front of upper sand boxes. Smoke box extended by 0.75 mm using supplied accessory spacer. Fairing added below smoke box door. Upper sand boxes flared into splashers to match those on an E1. 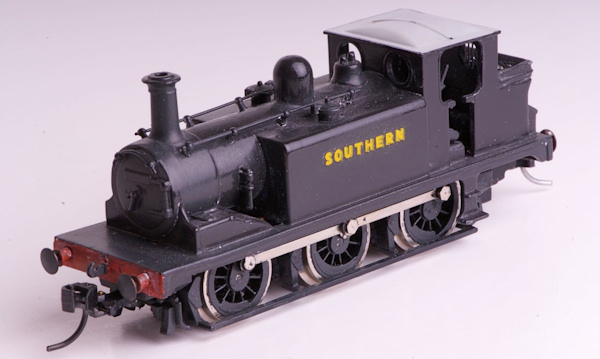 This conversion is discussed at length in the December 1990 issue of Scale Model Trains, and there is an account of a simplified conversion by Tim Stevens in issue 46 of Satellite 1:87. My own project is a little different as it presents one of the engines used on the Isle of Wight.